Hooked up to the loudspeaker terminals of a radio this device converts music into rhythmic light rays. 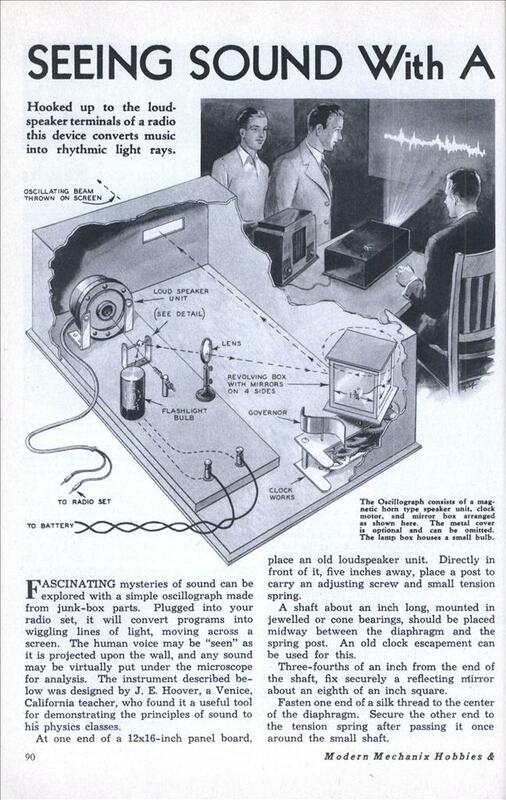 FASCINATING mysteries of sound can be explored with a simple oscillograph made from junk-box parts. Plugged into your radio set, it will convert programs into wiggling lines of light, moving across a screen. The human voice may be “seen” as it is projected upon the wall, and any sound may be virtually put under the microscope for analysis. The instrument described below was designed by J. E. Hoover, a Venice, California teacher, who found it a useful tool for demonstrating the principles of sound to his physics classes. At one end of a 12xl6-inch panel board, place an old loudspeaker unit. Directly in front of it, five inches away, place a post to carry an adjusting screw and small tension spring. A shaft about an inch long, mounted in jewelled or cone bearings, should be placed midway between the diaphragm and the spring post. An old clock escapement can be used for this. Three-fourths of an inch from the end of the shaft, fix securely a reflecting mirror about an eighth of an inch square. Fasten one end of a silk thread to the center of the diaphragm. Secure the other end to the tension spring after passing it once around the small shaft. In one end of a metal cylinder about 1/2 x 3/4-inch, place a flashlight bulb and socket. An old automobile dashlight may be used, but it must be closed so that light can escape only through a 1/32-inch hole drilled through one wall, half an inch from the top. Mount the cylinder or dashlight on the panel in such a manner that light emitted through the hole will fall upon the mirror. A lens about 1-1/2 inches in diameter must be fastened to the panel in such a position that rays from the bulb will be reflected through the lens by the small mirror. Any lens will do so long as it has a focal length of several inches—long enough to bring rays of light from the dash bulbs to a focus upon the revolving mirror. Fashion four mirrors, each 1% inches square, into a box and mount it securely on the shaft of an old clock. The clock must be securely mounted on the panel so there is no vibration and the mirrors must run true without wobble. Speed of the mechanism can be controlled by attaching a fan blade to one of the shafts of the clock to form a governor. This fan may be fashioned from any light strap metal. By the rotation of the mirrors, the light reflected from the flashlight bulb is thrown upon a screen a few feet away. The screen may be a piece of paper tacked to a drawing board. If sensitized paper is substituted and the instrument used in a dark room, a photograph record may be made. Simply expose the paper for the desired interval of time, then develop it like an ordinary snap-shot print. The oscillograph is connected to the loudspeaker terminals of any radio employing a magnetic type speaker or to the plate prongs of the two output on a more modern receiver. Where the receiver uses but a single output tube connect one lead to the plate prong of the tube and the other to the set chassis. This is pretty neat! 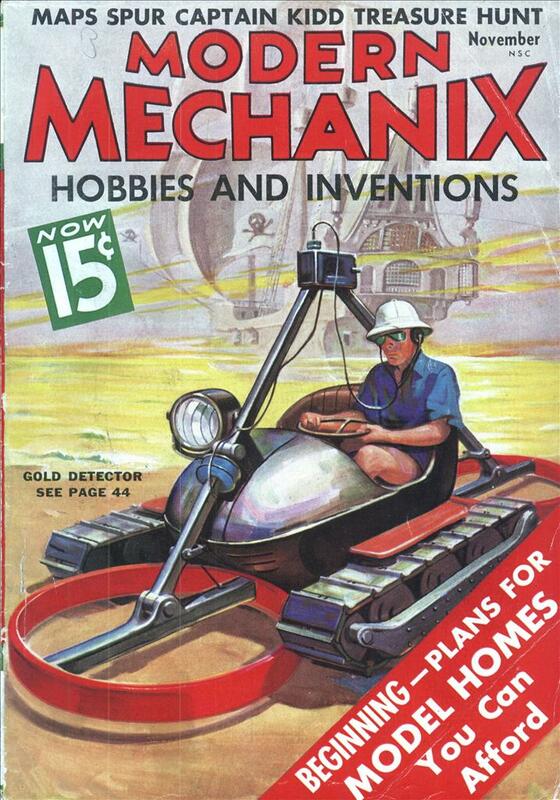 Just the sort of thing I would have attempted to make in my youth had I seen these plans. I’ve seen similar projects, where a mirror is bonded to the speaker cone to deflect a laser beam. One of the few home projects these magazines feature that could actually work and be interesting. Best of all, it’s an oscilloscope without the ‘scope. That was more electro-chemical than mechanical. There was a British show in the 1990s – probably BBC – titled “The Secret Life of Machines.” In one episode, they performed a ‘fax’ transmission using two drill presses and an ignition coil, if I recall correctly. The spark burned marks on paper on the receiving end, though I can’t recall how the transmitter worked. They also transmitted a picture marked out with flour in a pasture, over a hill to another pasture, by waving a flag as a signal to dump or not dump flour as they paced across the grass. It was very fun to watch. Actually, anyone who likes ModernMex would probably love that show. @[email protected] I have a vaque recall, that as a countermeasure an offbalance electric motor was attached to the windows, which prevented evesdropping with lasers. And VERY heavy curtains also attenuate voices enough, that it cannot be detected by laser anymore. The Rooskies did something similar with microwaves. The advantage is the ‘bug’ required no internal power source. SLOM is one of my favorite shows. I looked for video tapes of it for years before it appeared online. The only place you could get them was an educational company in NZ and they were around $600. I actually met the host of the show last year at Maker Faire, he was really nice. The original British “Scrapheap Challenge”, which morphed into “Junkyard Wars”, was also great. And “Connections” with James Burke, of course. Toronto, I’ll add Full Metal Challenge to the TV list. I worked for a couple of years with a guy who was a team member on both FMC and JW. And I’ll also nominate Good Eats, which I’ve said to my wife is like “French Chef meets Secret Life of Machines” Tonight on the GE 10th anniversary special, Alton Brown said his inspirations were “Julia Child, Mr. Wizard and Monty Python”.